When conquistadors pursued the mythic Golden City of El Dorado rumored to be ruled by a king covered with a layer of pure gold dust who bathed each night in a golden lake, Samuel Sanchez was but a twinkle in the eyes of his countrymen. 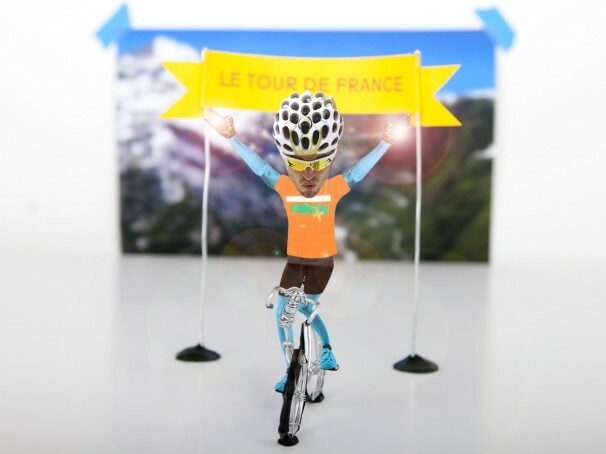 Today they celebrate as the Man of Gold (and sometimes solid bronze) conquered the first high mountain stage of the Tour De France. Winner of a gold medal in the 2008 Beijing Olympics, Sanchez carried his heavy golden prize for nearly three years over countless mountains, at some point mythically forging a great pair of golden glasses to match. Today he holds his bounties high with a mountain stage win. Myths and rumors aside, Hero devotion to Sammy Sanchez runs deep. In a tale as a true as the day is long, Allison Hero once celebrated Sammy’s birthday clothed in a fetching blaze orange dress. She also made a cake in his honor –carrot cake naturally. We expect to see Allison don that very dress this evening. Your king has come home! In other news, Hero brothers have arrived in France leaving this Hero behind at HQ (as Heroes occasionally do). Sharing the pain of Alberto Contador, I sit here sad and tired contemplating being dropped and perhaps now knowing that this is just “not my tour.” I can only think back to better days and watch as the two brothers find comfort on the steep slopes of the great climbs of The Tour. What will they bring home? Will I have my day again? Tags: 2011 Tour de France, Jelle.